Vancouver has emerged the global winner of a green city competition of 66 entrants from six countries around the world. 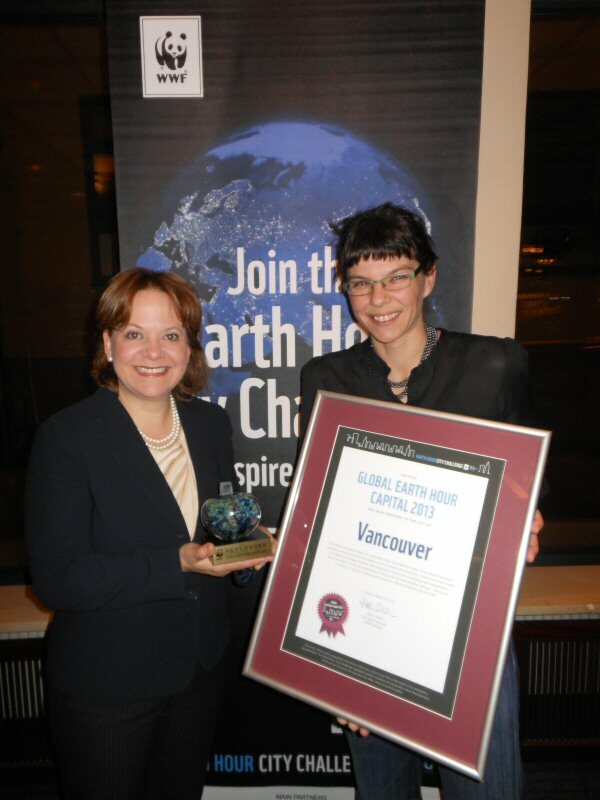 WWF's Earth Hour City Challenge (EHCC) has named Vancouver its Global Earth Hour Capital in recognition of the city's innovative actions on climate change and dedication to create a sustainable, vibrant urban environment. Vancouver was also named the People's Choice winner, scooping the highest number of online votes. After carefully reviewing the merits of the six finalists, the EHCC jury of experts unanimously cast their votes for Vancouver as the first ever Global Earth Hour Capital. Also in the running for the title were finalists Forlì, Italy; New Delhi, India; Oslo, Norway; Uppsala, Sweden; and San Francisco, USA. Vancouver will be presented with the Global Earth Hour Capital 2013 award at a conference on March 19, 2013 in Malmö, Sweden. "Local governments around the world are striving to create attractive, smart cities while tackling a multitude of urgent environmental challenges. Vancouver can serve as a role model for how cities can engage residents in these efforts, thereby accelerating the transition towards low carbon development. I applaud Vancouver's vision and innovation. More cities everywhere need to find inspiration in the bold initiatives of Vancouver and the other finalists and build on them, bringing climate action at the scale and speed necessary to secure sustainable, attractive lifestyles for people across the planet." "Being named the WWF's Global Earth Hour Capital is an exceptional honour for Vancouver and more international validation of our comprehensive efforts to be the world's greenest city. Even as national governments fail to act, it's essential that cities continue to lead the way in confronting climate change, and Vancouver's progress demonstrates that building a greener city also fosters a stronger local economy." The EHCC aims to mobilize action and support from cities in the global transition towards a climate-friendly future. Finalists were selected among the 66 participating cities from Canada, India, Italy, Norway, Sweden and the USA. Cities were asked to present actual climate commitments, performance and actions for evaluation by the jury who were asked to pay particular attention to cities with holistic, inspiring and credible plans for low-carbon development. WWF has worked closely with ICLEI - Local Governments for Sustainability, in mobilizing cities to join the challenge. ICLEI provided the use of its carbonn Cities Climate Registry - the platform through which data was collected. The Swedish Postcode Lottery has provided invaluable support to the project as the main financial partner. Visit www.earthhour.org/ehcc for more information. Join hundreds of millions of people worldwide and switch off your lights on Saturday, March 23 from 8:30 to 9:30 p.m. Visit www.wwf.ca/earthhour to join the movement. WWF's Earth Hour is an opportunity for individuals, businesses and communities around the globe to unite in a powerful call to action of hope for a better, healthier planet. In Canada, BMO Financial Group and the Toronto Star are the national sponsors, Ontario Power Authority is a regional sponsor and Staples Canada is the education sponsor. As sponsors for WWF's Earth Hour, BMO Financial Group, Toronto Star, Ontario Power Authority and Staples Canada will harness their incredible ability to engage employees and reach customers in spreading our message and encouraging individual action. To view the photo associated with this press release, please visit the following link: http://www.marketwire.com/library/20130318-Martha-and-Andrea800.jpg.